A few weeks ago Downton Band achieved a first in our 144 year-old history - the band made the trip up to Saddleworth near Oldham to take part in the historic ands pectacular Whit Friday Marches. Together with over 120 other brass bands, Downton Senior Band went from village to village, parading down the main street then playing a contest march in front of a judge. And at the Friezland contest we came sixth and won best tuba section, not bad for our debut! The summer is always a busy time for all three bands at Downton and we have already fulfilled a number of engagements including St Laurences Church Fete, Lover Country Fair, The Great Get Together in memory of Jo Cox MP in Whiteparish and a performance at Christchurch bandstand. Both the Senior Band and Training Band are back on home turf again on August 6th when we perform a free concert in Downton Memorial Gardens starting from 4.30pm. A collection for the blood cancer charity DKMS will also be held during the event. Bring along a picnic and enjoy a summer afternoon with our village bands. The Senior Band (meets Tuesdays 8pm) are seeking new players for cornet and tuba positions you need to be about Grade Three to Four standard or higher. Players who can play five or more notes and can read a bit of music are also very welcome to join our Training Band (meets Wednesdays 6pm) and those wishing to learn (any age) are very welcome to join our Beginners Brass Group (meets Mondays 6pm - 1st rehearsal 11th September). In all cases we can provide you with an instrument, all you need to bring is your enthusiasm. Please contact Paul on paulvwilliams@btinternet.com or 07951 834834. Beginner Brass - Launched soon! A new brass group from Downton Band will be launched soon - aimed at teaching the basics of brass playing to absolute beginners. 'Beginner Brass' will meet every Monday at 6pm. Participants will be offered high quality tuition and loaned an instrument and music so that the can practice and work at home, all for a cost just £1 Everyone is welcome to join our 'Beginners Brass' but we would recommend that children wait until they are five or six before they start playing. We have people of all ages and backgrounds, children, students, mums, dads, granddads and grand mothers playing with Downton Band. Places are limited and there is a waiting list to join - please email paul@downtonband.org.uk to reserve your place. Downton Band proudly presents its annual Christmas Concert on Saturday 19th December at Downton Memorial Hall (starts at 7pm). The evening will feature lots of lovely Christmas music, carol singing, crackerpulling and even audience participation! The concert will also see the debut of Downton's training band, a 35-strong group that began learning instruments in September. The band was formed thanks to generous grants from the People's Postcode Trust, Persimmon Homes and Wiltshire Council which funded the purchase of nearly £10,000 of new instruments to help the budding musicians learn to play. "We are very proud of our new training band; everyone has come together, worked hard and can now perform after just three months of learning. Their progress has been brilliant, they have achieved so much in such a short space of time. The training band will open our Christmas concert with some well-known carols before playing a few pieces together with the senior band and we are all looking forward to it immensely" said Downton Band's Musical Director Paul Williams. The senior band will also be appearing at the festive concert on the 19th playing lots of Christmas music, both traditional and new along with sing-along carols and more. The concert starts at 7pm (doors open at 6.30pm) on Saturday 19th December at Downton Memorial Hall. Tickets are £10 (£7.50 Under16's) available on the door or from Downton's The Cottage Loaf or The White Horse. More accomplished players (especially cornets and tubas) are wanted for the senior band who meetson Tuesday evenings. Downton Band launches its exciting training band in September and is still on the look outfor anyone who wants to take part and learn either a brass or a percussion instrument. The traditional brass band, that has recently celebrated 140 years of music making, is set to launch its training band on Wednesday September 16th with their first rehearsal at 6pm in the band's band room on Gravel Close. Paul Williams, Downton Band's Musical Director said: "The new band is open to anyone who wishes to come along and learn how to play an instrument. We have deliberately tried to make it as cheap as possible to learn with us as music tuition and instruments can be very expensive. For just £1 a week you'll get expert tuition, a weekly rehearsal, plenty of performance opportunities and the loan of an instrument to take home to practice. The band has been very fortunate to be supported by Wiltshire County Council's Community Grant scheme, Persimmon Homes Community Champions and the People's Postcode Lottery Trust, the charity funded entirely by players of the People's Postcode Lottery. This funding has allowed Downton to buy lots of new instruments that are now sitting on shelves waiting for our launch date for lots of learners to take them home and work on their musical skills." Downton Band is keen to hear from anyone who wishes to join their Training Band. Please get in touch via contact us to reserve your space. Downton Senior Band seeks cornet and tuba players to complement our band. Do you play a brass instrumen? Have you played in the past but want to take it up again? If so then please read on! We are a happy band rooted firmly in the local community with our own band room, a good stock of instruments and a soon to be launched training band. We are not too busy or too quiet but have lots of fabulous and exciting annual gigs. We now rehearse weekly on Tuesday nights (8pm - 10pm) with more rehearsals scheduled before contests. Contact our MD Paul Williams on paul@downtonband.org.uk for more info (other instrumentalists also very welcome). The CD is available from Hayes Music Limited in Totton, 02380 860889 or www.hayesmusic.co.uk or direct from the band - contact the band for more information. Downton Band is celebrating following the award of a grantto kick start their training band project 'Bash & Blow'. The traditionalbrass band, that has recently celebrated 140 years of music making, will be launching a training band in September to encourage young and old to take up brass and percussion instruments. And the band are delighted to learn that they were successful in applying for a grant of just over &pount;6,500 from the People's Postcode Lottery Trust to help launch the new band. Downton's Musical Director Paul Williams said "The money will go towards purchasing new instruments so that anyone interested inlearning will be able to use a brand new shiny instrument come September." Paul Williams added "The training band is open to anyone who wishes to come along and learn how to play an instrument. For just £1 a week you'll get expert tuition, a weekly rehearsal, plenty of performance opportunities and the loan of an instrument to take home to practice. We want to make access to music making open to everyone so there will also be a bursary available for those who genuinely can not afford the subscriptions." A waiting list of eager training band participants is growing daily ahead of Bash & Blow's launch in September. Downton Band is also searching for more cornet and tuba players to bolster the ranks of the senior band. Paul Williams added "The band has a busy and varied schedule of performances, good quality instruments ready and waiting and its own bandroom in the heart of our village. We'd be delighted to welcome anyone who perhaps wants to return to banding who wants to pick up a cornet or even a tuba again." Gaps! The band has been reorganised. Revitalised! With new players and returning players. Moving around the band players. But we remain at heart the essential Downton Band. With newlywed MD Paul Williams established at the helm and working the band hard over the autumn and Christmas This year our first big test has been the Regional Contest qualifiers and grading competition in Torquay was deemed a fantastic success. An excellent - perhaps surprising- fourth place in our section. Challenge: as the piece "Variations on Maccabeas" has some of the hardest tempo settings we'd ever seen on our music stands. With new players Vicky, Winston, and Orjan playing with us at this level for the first time and returning stalwarts Jo, Mike and Danny helping to fill gaps left by Ben (clash of dates), Sam (basic training RAF), Martin, Trev, Pete (all missed - best wishes to all) it was a new look band. With players popping up in odd seats since January. So reorganised and revitalised after Christmas and with a completely new front row, solo horn (congratulations Miriam) months of preparation were, literally, put to the test. The piece is based on a well known hymn. The lines most people recognise are Thine be the glory, risen conquering son, ever is the victory, thou o'er death has one. Stirring stuff and with or without a Christian faith the music is emotional invigorating and lyrical. It communicates well the passion of living with a goal and purpose and, like real life, has some tricky moments. Before we played there were some uncomfortable times in the band room; frustrating, impossible, embarrassing, moments. But great rehearsal which demanded concentration and persistence. Hard work approached wholeheartedly by every Downton player. And by Saturday 12 March we felt as best prepared as we could be to compete. But it's often said: "Life is not a rehearsal!" And nor is a contest performance. However happy or not we were with the state of the piece, at 2pm our moment to bring out the best in us. And with Pete adding to our good luck with a shower of seagull poop we were pleased to render a great performance- not without slip or blemish - but at the peak of our potential. Everyone was delighted and we celebrated in appropriate Downtown style! To hear how the band is sounding please plan to join us our Concert, Sunday May 3rd - Cuckoo Fair weekend! Downton is proud to welcome a new Musical Director, Paul Williams, to lead the band into a new era of its long history. Paul started his musical journey at Oakmead School learning brass in the famous school band under Colin Courtney. Thanks to the free musical tuition available at the time Paul began on cornet, moved to tenor horn before finding his home on percussion with lessons from the Bournemouth Symphony Orchestra&apos;s Chris Guy and the late great James Blades. Paul gained a place at the prestigious Royal Northern College of Music, regarded as one of the best music conservatoires in Europe where he studied composition with Anthony Gilbert and Sir Harrison Birtwistle winning several prizes along the way. New York publisher HaMar Percussion Publications now publishes Paul&apos;s music. Paul started conducting in his 20s with the Dorset based student orchestra "Gli Amici Della Musica" performing many large scale works. He studied conducting with Clark Rundell and Dr Jack Stamp and has a large experience of conducting wind bands, ensembles and orchestras. But the lure of brass has always drawn Paul back and he can often be found waving a stick in front of a brass band around the south west region. Paul also holds the position of the bandmaster of Woodfalls Band, a role that sees him conduct the local championship section band at many occasions throughout the year. During the Queen&apos;s Diamond Jubilee Paul had the responsibility of conducting the band in front of Her Majesty the Queen and His Royal Highness The Duke of Edinburgh. Paul holds the principal percussion chair at Woodfalls Band, has played for numerous world famous brass bands including Black Dyke, Carlton Main Frickley Colliery Band and Brighouse and Rastrick, is a freelance orchestral percussionist, plays drum kit in a folk rock band and holds several music teaching posts including Poole Grammar School, Bournemouth School and King Edward VI School. Downton's popular brass band is saying goodbye to the end of an era! The Band's highly popular Musical Director (MD) of some 16 years, Roland Wright took the decision to leave on a high note at the end of 2013 conducting the band's enjoyable "Christmas Spectacular!" concert. Roland's successes have included a hat-trick to the National Finals rocketing the Band from the 4th section to reside now in the second section in the national rankings. In a warmly emotional final concert the MD and former Bournemouth Concert principal cornetist thanked the many band members and friends he had made along the way. Roland remains busy, still resident MD of nearby Michelmersh Silver Band and with family and grand-children now in tow, he will hopefully be able to find time to visit his brass family in Downton often! The 140 year old Band now have the task of searching for a new resident MD, but in the meantime have enlisted the services of former Principal Musical Director of the Royal Marines Lt. Col. Chris Davis OBE to take them to this years Regional Finals in Torquay, in March. Solo Horn, Pete Jung - now 43, has been in Downton Band since 1981. He remarked, this year will probably be the most exciting and challenging in my memory of the Band, but were all ready to work together, and I know being a part of it will be a lot of fun! Downton Band were delighted last year to be bequeathed a generous donation from the estate of Brass Band fanatic and ex-Woodfalls Band drummer the late Mr. John Hand. The donation prompted the band to refresh the logo and branding. Bournemouth based photographic and creative design company TobyMedia.com produced the design which was then used for letterheads, clothing and a new set of 25 stand banners to smarten the bands image for many years to come. On the reverse side, each banner is embroidered In Respectful Memory of Mr. John Hand. At 7am when the "Friends of Downton Band" began setting up their stall at the Cuckoo fair, the weather didn't look at all promising. With around 100 cakes to sell for the Band's funds we wondered if we might all be eating cake until June! Still, the British weather blessed us; the Band performed well, and as usual drew quite a crowd. With an opening fanfare, the procession up the Borough and a day's playing, plus the DCT service on Sunday morning and a full house for their Sunday evening concert, it was a busy weekend for the Band. You can see more of the Jubilee Brass on the 15th of June at Alderbury School Fete, and 16th at the Moot High Jinx. Also the St. Laurence.s Fete on the 29th. 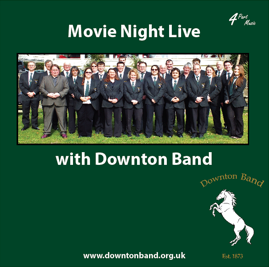 Dates for your diary for Downton Band are 29th June - Trafalgar School Fireworks Concert (also with Woodfalls Band), Fordingbridge show on the 20th July, and of course 3 days at the New Forest Show 30/31/1st August. Supported by the players of the People's Postcode Lottery. The People's Postcode Lottery Trust is a grant giving charity funded entirely by players of the People's Postcode Lottery. Downton's Training Band "Bash & Blow" are very grateful to receive £6536 from the trust. For more information about The People's Postcode Lottery Trust please click here.